I have a weakness for ice cream, especially luxury ice cream. My freezer always has at least one tub of ice cream. Now that summer is upon us I also have a nice selection of ice lollies. Good thing about England is that for as long as the sun comes out and its summer there will be price wars all those lovely frozen treats. Which means temptation galore for me. 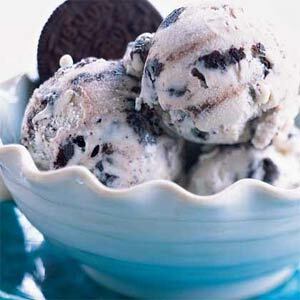 When I was younger living in the states one of my favourite ice cream flavours was cookies and cream (made with oreo cookies) and marble fudge. The only company I know to have cookies and cream is Haagen Daz. So I do splurge throughout the year paying out about £3.59 or more for one tub. So imagine my delight when not one but two supermarkets I go to have them on offer. Sainsbury’s currently selling 2 for £5 and I have recently been told Asda is selling these gorgeous ice creams for £2 a tub. So right now I am trying to stay away from the ice cream sections. Once I start eating a tub of Haagen Daz I can’t stop. Those tubs are way too small for the price but the taste makes up for that no less. Thankfully I am not in London as having had a look at the Haagen Daz website I have discovered that they have a shop in Leicester square where you can go and have afternoon tea. If only.